The idiots in charge of China’s internet censorship have just made themselves look even more childish and stupid than usual. They have banned Winnie the Pooh! All mention of Winnie is being scrubbed from websites and social media even as I write this. What has poor Winnie done to deserve this? 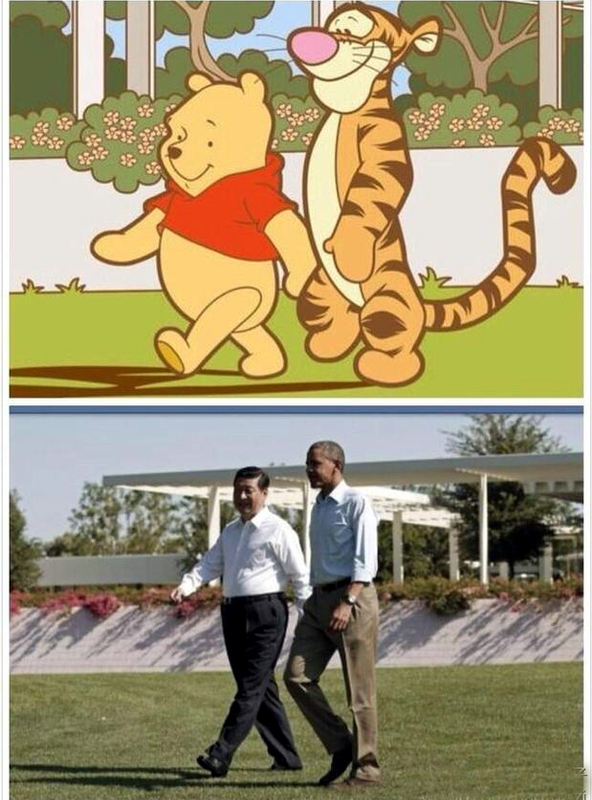 It seems to go back to 2013 when President Xi visited the USA and the cartoon below was issued and spread wildly and widely. There is something deeply wrong with a government totally devoid of a sense of humour. They are sick. Laughing (even at ourselves) is healthy. China isn’t.
. This entry was posted on Monday, July 17th, 2017 at 7:01 pm	and is filed under Censorship, China News, Stupidity. You can follow any responses to this entry through the RSS 2.0 feed. Both comments and pings are currently closed. Is it just me or is it really off-putting to see a white Westerner spitting and looking down on China? Making value judgments is pretty rich for being the ones who started the Opium War. How about some tolerance and understanding of The Other, and the realization that they might have different objectives from your own. Deeply wrong, yes that’s a good phrase to start with. Thank you for your interesting comment. Tell me, does it hurt having your brain removed? So I’m a white Westerner? How would you know what colour I am? The opium wars were well before I was even born. Before my parents were born, but yeah, blame me for them. Looking down on China? There is no evidence in my post that I am looking down on China. I am looking down on some petty bureaucrat in the evil CCCP. That is not the same thing, but I don’t suppose your feeble mind can work out the difference between hating a country and hating its government. For someone who hates my blog so much, you spend a hell of a lot of time looking at it.